Thing 7 module centres on your own online identity and suggests your online identity should be considered part of your professional identity. The ‘Getting Started’ activity encourages you to Google yourself and see what kind of results pop up. It appears the results are more professional than personal (except for Facebook). 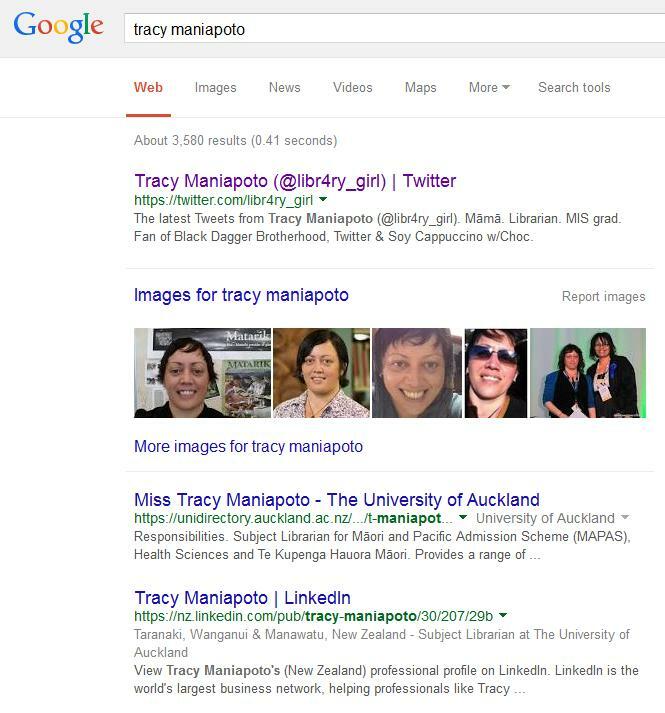 Interestingly, when I looked at the images tab on Google, there were quite a few images of people I know from either my workplace, former workplace, and the library world including my profile that features on Victoria University’s Graduate Profile page for the School of Information Management. While we weren’t required to write a post for Thing 7 I thought it would be interesting to document what I found so I can compare again at a later point. Kia ora ! Enter your email address to follow this blog and receive notifications of new posts by email.